UNITED NATIONS, Aug 27 2014 (IPS) - Can we envision a day when a critical mass of companies is investing in a better world? Where business is delivering value for the long-term – not just financially, but also socially, environmentally and ethically? Over a decade ago, it was hard to imagine, but we can now say with confidence that a global movement is underway. This year, business will have an enormous opportunity to “make good” on its commitment to society as governments and the United Nations work to define a set of global sustainable development goals by 2015. From 40 companies that came together at our launch in 2000, the UN Global Compact has grown to 8,000 business signatories from 140 countries – representing approximately 50 million employees, nearly every industry sector and size, and hailing equally from developed and developing countries. Each participant has committed to respect and support human rights, ensure decent workplace conditions, safeguard and restore the environment, and enact good corporate governance – and then is reporting publicly on progress. An additional 4,000 civil society signatories play important roles, including holding companies accountable for their commitments and partnering with business on common causes. We now have 100 country networks that are convening like-minded companies and facilitating action on the ground, embedding universal principles and responsible business practices. Networks serve an essential role in rooting global norms, issue platforms and campaigns within a national context, and provide an important base to jump-start local action and awareness. It is clear that companies around the world are increasingly putting sustainability on their agendas. The reality is that environmental, social and governance challenges affect the bottom-line. Market disturbances, social unrest and ecological devastation have real impacts on business vis-à-vis supply chains, capital flows and employee productivity. We also live in a world of hyper-transparency, with people now more empowered than ever to hold governments and the private sector accountable for their actions. There has been a fundamental shift as companies come to realise that it is no longer enough to mitigate risk, but that they are expected to contribute positively to the communities in which they operate. More persuasive than the risks are the opportunities that come with going global. As economic growth has migrated East and South, more companies are moving from being resource takers, to market builders. Now, when faced with complex issues – extreme poverty, lack of education, gender inequality, environmental degradation – responsible companies see themselves as equal stakeholders for the long run, knowing that they cannot thrive in societies that fail. This has encouraged business to collaborate and co-invest in solutions that produce shared value for business and society. There is also a growing interdependency between business and society. Business is expected to do more in areas that used to be the exclusive domain of the public sector – from health and education, to community investment and environmental stewardship. In fact, five out of six CEOs believe that business should play a leading role in addressing global priority issues. This is extremely encouraging. While we have seen a great deal of progress, there is much work to be done. Companies everywhere are called on to do more of what is sustainable and put an end to what is not. We need corporate sustainability to be in the DNA of business culture and operations. The priority is to reach those who have yet to act, and especially those actively opposing change. To reach full scale, economic incentive structures must be realigned so that sustainability is valued. Governments must create enabling environments for business and incentivise responsible practices. Financial markets must move beyond the short-term, where long-term returns become the overarching criteria for investment decisions. We need clear signals that good environmental, social and governance performance by business is supported and profitable. This year, business will have an enormous opportunity to “make good” on its commitment to society as governments and the United Nations work to define a set of global sustainable development goals by 2015. This post-2015 agenda has the power to spur action by all key actors, with the private sector having a huge role. These goals and targets could result in a framework for businesses to measure their own sustainability progress and help them establish corporate goals aligned with global priorities. This opportunity is significant to create value for business as well as the public good. What will the future look like? The pieces are in place to achieve a new era of sustainability. The good news is that enlightened companies – which comprise major portions of the global marketplace – have shown that they are willing to be part of the solution and are moving ahead. Decisions by business leaders to pursue sustainability can make all of the difference. We can move from incremental to transformative impact, showing that responsible business is a force for good. 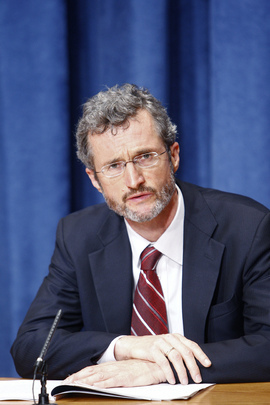 Georg Kell is executive director of the United Nations Global Compact, the world’s largest voluntary corporate sustainability initiative. Hello Mike, I fully subscribe to your opinion. The Global Compact is nothing more than a whitewash, a PR instrument “to change, so that everything remains the same.” We are about to publish a succinct response to Kell’s charade from one our colleagues, where he debunks what he regards as Kell’s black sense of humour. Warm regards.